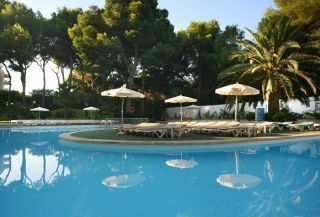 Situated in Playa de Palma, 350 m from the beach, 6 km from the airport and 12 km from the capital city Palma de Mallorca. The closest bus stop is 300 metres from the hotel. The guestrooms are equipped with complete bathroom (shower or bath), TV, telephone, ceiling fan, safe and a balcony. The hotel Bali has a restaurant, a bar, swimming pool (in winter indoor), small playground for children, table tennis, billiard and entertainment. If you book All Inclusive: Starting from summer 2006 hotel Bali offers “All Inclusive” PLUS! Breakfast-buffet until 11:00 am. A varied continental buffet wholemeal products and “on the spot” cooking stations. Lunch: Cold and warm buffet and dishes prepared “on the spot”. Dessert buffet. Dinner in two shifts: Cold and warm buffet and dishes prepared “on the spot”. Theme buffet twice a week. Snacks: Between 11 am and 1 pm sweets in buffet. From 11 am till 3 pm snacks and sandwiches. From 3 pm till 5 pm coffee and cakes.